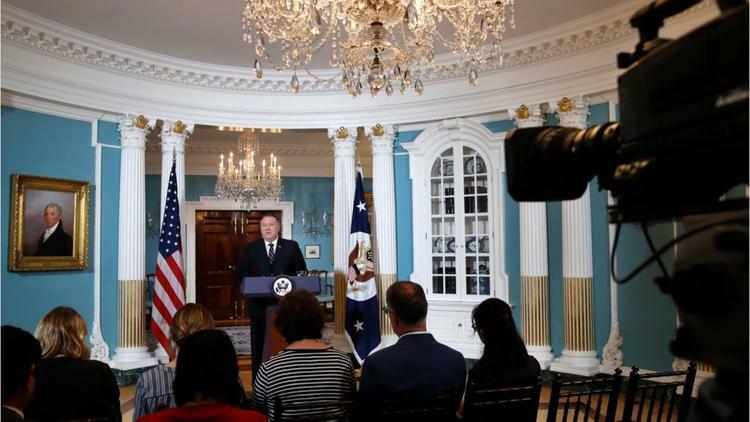 Secretary of State Mike Pompeo announced Monday that the Trump administration would slash refugee admissions to 30,000 in 2019, down from 45,000 in 2018 and from 85,000 in fiscal 2016. Refugees come in numbers to the US when there is a crisis in their own country. 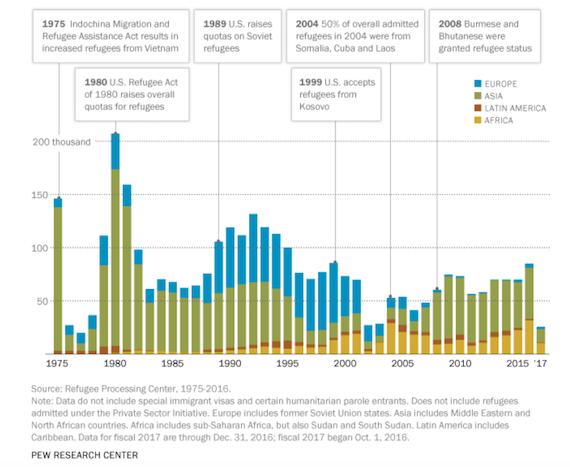 At the same time, US policies toward refugees in the past have often been political and not just humanitarian, and there is a strong instrumental streak in the admissions patterns. In other words, Washington has often asked what we get out of letting refugees in, and not just what we can do for them. Nowadays, there is a special, separate program for bringing in Iraqis who helped US troops as translators or in other capacities, and the Pentagon is worried that Trump is not letting in enough of them. If the word gets out in Iraq that the US military will use you and then leave you and your family twisting in the wind when ISIL comes after you, then no one will be willing to serve as interpreter or fixer for the some 6,000 US troops still in that country. So you could argue that the US has a responsibility to Iraqi refugees, since Bush invaded their country on flimsy pretexts and turned the society upside down. The resultant war, occupation and guerrilla push-back were such that some 1.5 million refugees were created internally, and 2.5 million were pushed abroad. That is 4 million Iraqis who would never have had to leave their homes if the US had not invaded and occupied them and provoked the rise of al-Qaeda in Mesopotamia and then the Islamic State of Iraq. Likewise, the US bears some responsibility for all the civilians displaced in eastern Syria as a result of its war there on ISIL in alliance with Kurdish fighters of the YPG guerilla group. How cynical the US follow-up has been is illustrated by an experience I had. In summer of 2008 I went to Jordan and did some research on the condition of Iraqi refugees there. I was told by someone who should know that the Bush administration was afraid that the Iraqi refugees there might riot, putting GOP standard-bearer McCain in jeopardy, and therefore was finally going to let Iraqi refugees come to the US in large numbers (Bush let in 13,775 in 2008, compared to less than two thousand the previous year). But this was done in large part to keep from embarrassing McCain. The political character of US refugee admittances stretches back into the mists of time. In the 1970s, the US let in a lot of refugees from South Vietnam, in part to reward families that had supported the US war there and in part because the “boat people” crisis that developed when Vietnamese fled to southeast Asian countries that put them in camps. In 1980 the Mariel boatlift and other routes brought 125,000 Cubans to the United States, and letting Cubans into the US was an attempt to undermine the Communist Castro government that the Kennedy administration had tried and failed to overthrow. Through the 1980s, extra slots were awarded for Soviet refugees, as part of the Cold War with the Soviet Union. After President Bill Clinton intervened to save the Kosovars from ethnic cleansing or severe repression at the hands of Serb nationalists, the US let in refugees from Kosovo to show solidarity with them. So Pompeo in adopting this curtailed immigration program is hurting the US, not just the immigrants. Not letting immmigrants from Iraq signals that we won’t reward interpreters and other helpers of the US war effort. It discourages Iraqis from proffering their help even now. The US in the old days deployed refugee policy to create allies. Trump doesn’t have that prospect, of friendship and support.